Sonia Gandhi took on the KCR government on November 23 at her maiden rally in the state, alleging that it has done nothing for farmers or youth over the last four years. The rally, christened as a “Thanksgiving” meeting for Mrs Gandhi by the Congress, was her first visit to Telangana after the formal birth of India’s 29th state. It was the only public meeting attended by her in the run-up to assembly elections in five states. KT Rama Rao accused rival N Chandrababu Naidu of trying to control Telangana through his newly-formed alliance with the Congress when asked why the TRS is focussing most of their campaign on Mr Naidu. KCR had said that Mr Naidu’s Telugu Desam Party does not have even 2 per cent vote share in Telangana. “Naidu’s popularity is on the wane even in Andhra Pradesh. Naidu does not represent Seema or Andhra people. But Naidu tried to destabilise our government by trying to buy legislators,” KT Rama Rao, or KTR as he is popularly known, said. In his public meetings, KTR has also been referring to a cash-for-vote case in which Mr Naidu was alleged to have tried to bribe a legislator for a local body election. “Naidu wrote to Central Water Commission to stop Telangana projects. Naidu accused Telangana of building illegal projects. So why should I not criticise him?” KTR said. KTR also responded to Prime Minister Narendra Modi’s attacks on his father’s personal beliefs. “This chief minister feels so insecure…he trusts astrologers, does puja, ties nimbu-mirchi (to ward off evil),” the Prime Minister had said during his campaign in Telangana. “I have seen (PM) Modi prostrate before naked babas. (PM) Modi would have a lot to answer if we were to question personal issues,” KTR said. On the Ayodhya issue, KT Rama Rao said, “The subject is sub-judice but Ram temple is not what people want. There are enough places of worship and gods, for God’s sake. If you ask the common man, he would rather have schools and hospitals and roads,” he said. 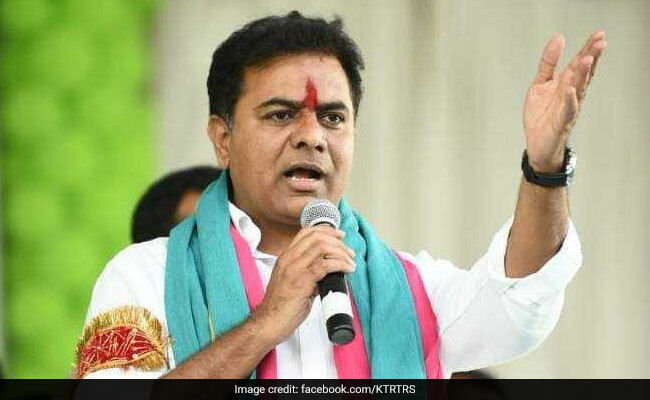 “Whatever stokes further hatred and division should not be supported,” KTR said.